STM-2 combines the simplicity of USB connectivity with the accuracy of a precision measurement engine, all in a compact, inexpensive package. The size and simplicity of STM-2 help make setup and operation easy and efficient. STM-2 is the most accurate USB powered thin film monitor in the industry. Ten measurements are taken per second while achieving a resolution of 0.037 Å per measurement (density of 1). STM-2 comes with everything you need to connect your QCM sensor/feedthrough to a Windows® PC. Simply connect the included BNC cable from the feedthrough to STM-2, then connect the STM-2 to your PC using a standard mini USB cable (included). No external oscillator or power supply is required. STM-2 features an internal oscillator that allows for simple and cost effective installation when STM-2 is located within 1 m (40 in.) of the quartz crystal. 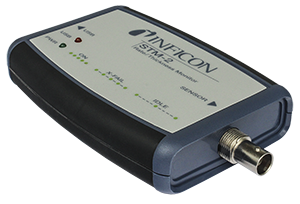 A standard INFICON oscillator kit can be used for applications where STM-2 must be located farther away from the feedthrough. STM-2 includes LabVIEW® software, capable of simple operation and data logging. Windows software is also included for operation and data logging of up to eight STM-2s simultaneously (each STM-2 requires a powered USB port).